Stella the kākāpō on Codfish Island. This resource has been developed by our partners Meridian Energy. kākāpō conservation: the role of people in protecting kākāpō. This infographic explains what a kākāpō is, why they are so vulnerable and how people are working together to help them survive. 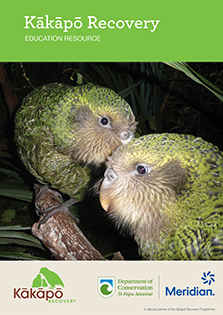 contribute to a positive future for kākāpō. Recognise that living things are suited to their particular habitats. Ask questions, find evidence, explore simple models and carry out investigations to develop simple explanations. Statistical Investigation: Conduct investigations using the statistical enquiry cycle: gathering, sorting, and displaying multivariate category and whole-number data and simple time-series data to answer questions.